These muffins are absolutely amazing! The recipe uses a combination of butter and oil to provided both flavor and moisture, while buttermilk adds richness and a slight tang. The muffins crumb is moist and tender, yet sturdy enough to support the blueberries. Best of all, they are packed full of flavor...every bite bursting with blueberry yumminess either from fresh whole blueberries or a blueberry sauce. To make the berry sauce, half of the fresh blueberries are cooked down into thick jam-like sauce to concentrate their flavor and reduce excess moisture. 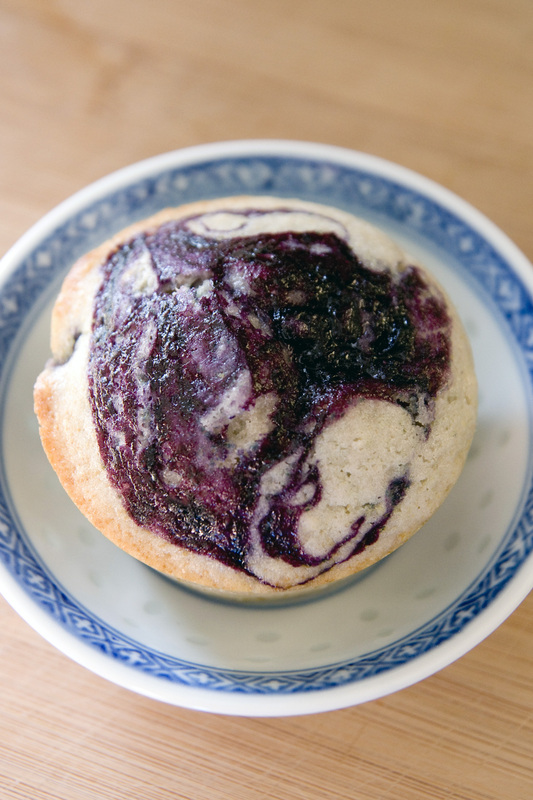 The berry sauce is then swirled into each batter-filled cup to spread concentrated berry flavor throughout each muffin just before baking. The berry sauce is an additional step not found in other recipes, but it's also a step that elevates this recipe above those other recipes. Place oven rack in upper-middle position and heat oven to 400 degrees F.
Spray standard twelve-cup muffin tin with nonstick vegetable cooking spray: set aside. In a small saucepan set over medium heat, combine one cup of the blueberries and one teaspoon sugar and bring to a simmer. Use a spoon to smash berries and stir frequently while cooking until berries have broken down, mixture has thickened and reduces to about 1/3 to 1/4 cup. Remove pan from heat; set aside and let cool to room temperature. In a large mixing bowl, whisk together flour, baking powder, and salt. Sprinkle a scant tablespoon of flour mixture over remaining cup of blueberries and toss to coat; set aside. In a medium bowl, whisk together remaining sugar and eggs until mixture is pale yellow, thick and fluffy. While whisking, slowly pour in melted butter and oil and mix well. Whisk in buttermilk and vanilla until completely incorporated. Using a spatula, gently fold egg mixture and remaining cup of (flour coated) blueberries into flour mixture until just incorporated. (Batter should be lumpy with some small sprays of dry flour still visible; DO NOT overmix.) Using a portioning scoop or large spoon, distribute batter equally among prepared muffin cups (batter should fill cups and mound slightly). Place at least a teaspoon of cooled berry mixture in center of each batter-filled cup, and gently push it below surface. Use a bamboo skewer or large toothpick to gently swirl berry mixture into batter to spread concentrated berry flavor throughout muffin. Sprinkle turbinado sugar evenly over batter. Place in oven and increase temperature to 425 degrees F.
Bake muffins until tops are golden and just firm (or until a toothpick inserted into the center comes out clean), about 17 to 19 minutes, rotating pan halfway through baking time for even baking. Transfer tin to a wire rack to cool slightly, about 5 minutes. Invert muffins onto wire rack, stand muffins upright, cool 5 minutes longer, and serve warm. Muffins will keep for 2 to 3 days in an airtight container.